One bedroom and one en-suite bathroom. Sleeps two. Ample parking. 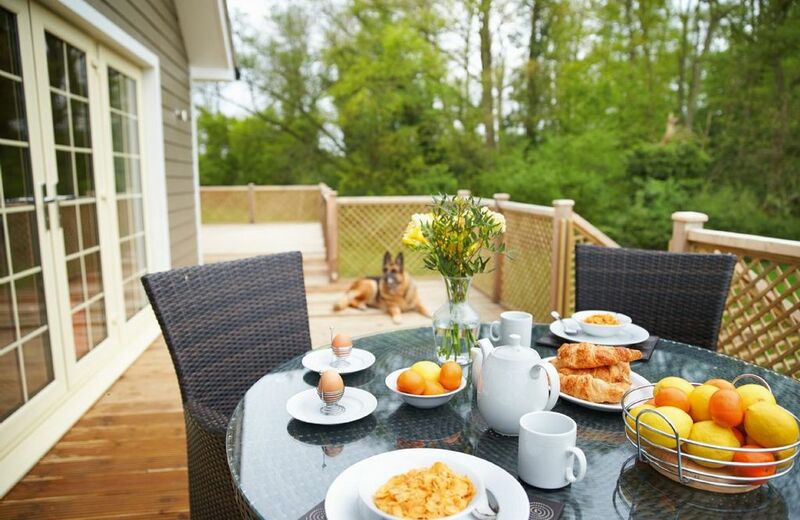 Brook Lodge is one of five detached luxury lodges which are located in idyllic countryside on the Wakes Hall Estate in the breath-taking Colne Valley on the Essex/Suffolk border. On the same site is Endymion Lodge. Each lodge boasts a verandah and the ultimate indulgence &ndash; a soothing hot tub, surrounded by 500 acres of land and walks to the village of Wakes Colne. Wakes Hall Lodges offer the ultimate place to escape the city or your hectic lives. Nature lovers will have a wonderful time taking in the stunning flora and fauna of the delightful countryside. As well as a fishing lake stocked with Carp and Roach, there are an endless number of woodland walks to explore, including the neighbouring willow woodland where the trees are farmed to make cricket bats. Visitors often enjoy a short amble to the local village where there is a shop and post office and a picturesque pub beside the River Colne that serves locally brewed beer. Local beauty salons provide a full range of services for visitors to the lodges, and for those looking for an extra special treat, we can arrange for a fully trained chef to serve up a delectable feast from the comfort of your lodge. One bedroom and one en-suite bathroom. Enclosed decked area and access to a two acre fishing lake and woodland. Electric hob and oven, microwave, fridge/freezer, dishwasher, washer/dryer. Colchester can be reached in just under 20 minutes and offers a wide range of activities for all ages from Colchester Zoo to the Roman Castle. A little further afield, Chelmsford is just under 40 minutes' drive time and has a first class shopping centre. Sudbury, the birthplace of Thomas Gainsborough, is just under half an hour's drive or by train from Wakes Colne/Chappel Station direct to Sudbury through the picturesque countryside. En-suite bathroom with a free standing bath and walk-in waterfall shower. The latest eco-technology from Canada. Electric heating. Electric hob and oven, microwave, fridge/freezer, dishwasher, washer/dryer. Two Smart TVs, superb quality sound system. WiFi*. Travel cot and high chair available on request. Please bring your own cot linen. Garden furniture and hot tub. *Please note that internet access is offered at this property for recreational purposes only and is not meant for business use. Speed/service may vary depending on the package obtained by the owner which is provided to guests free of charge. Should guests experience difficulties or loss of use, neither the owner nor Rural Retreats will be held responsible.